I could not resist publishing this older blog once more. It certainly does bring back memories! 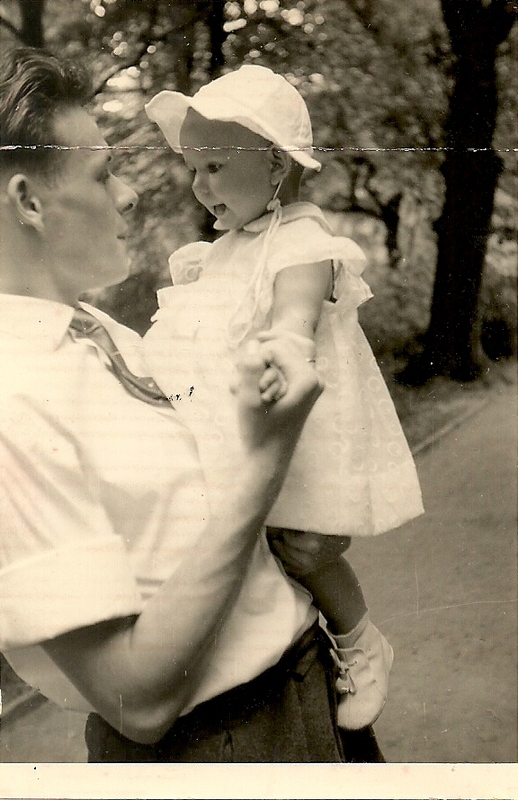 This pictures was taken in Düsseldorf, Germany, in a park called ‘Hofgarten’, on 17th June 1958. Gaby was not quite nine months yet at the time. This pictures was taken by Uta’s Mum on her balcony in Berlin in August 1958. Gaby was nearly one year old. We were for a visit in Berlin at the time. Uta with Baby Martin, two months, Monika, eighteen months, and Gaby thirty-three months. 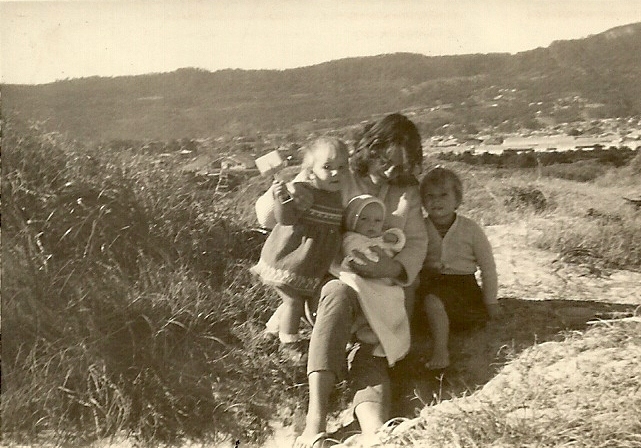 This pictures was taken near Fairy Meadow Beach, New South Wales, Australia, in June 1960. 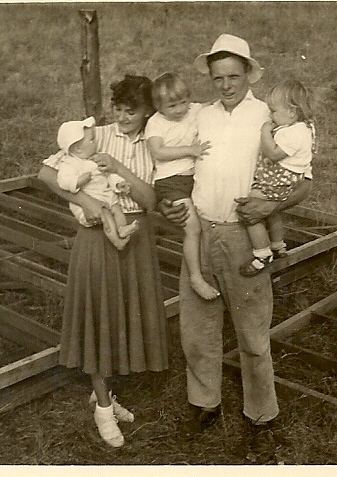 This is where the pioneer family ended up in Oak Flats, NSW, Australia, which was ‘the sticks’ at the time. This picture was taken on the 28th August 1960 which was Gaby’s birthday. We were building a garage at the time. One year later the children were stricken by polio; as it turned out, Gaby very severely. I wrote the above in January 2013. I was looking for a photo from our Berlin visit in August 1958 and found one in this blog. I was pregnant at the time. In December our daughter Monika was born in Düsseldorf where we had one room in my father’s apartment. We thought being given the opportunity to go to Australia as migrants was the best thing that could have happened to us. The beginning in Australia was tough and sometimes we felt like a “pioneer family”.. On the beach picture you can clearly see the Fairy Meadow Hostel were we lived for a while. You’re right, Peter, the beach was only a few steps away from the hostel. I thought it was great to have the beach so close. The picture you refer to was taken in June, in the middle of the Australian winter! Great archival type photos, which reminds me it’s time to straighten up our family photos. Thanks for commenting, Robert. I read your profile, which is very interesting. Do you do any writing? You seem to be a very contemplative person. If you’re writing, I’d like to hear more about it. I love the old photos. Your family was beautiful. 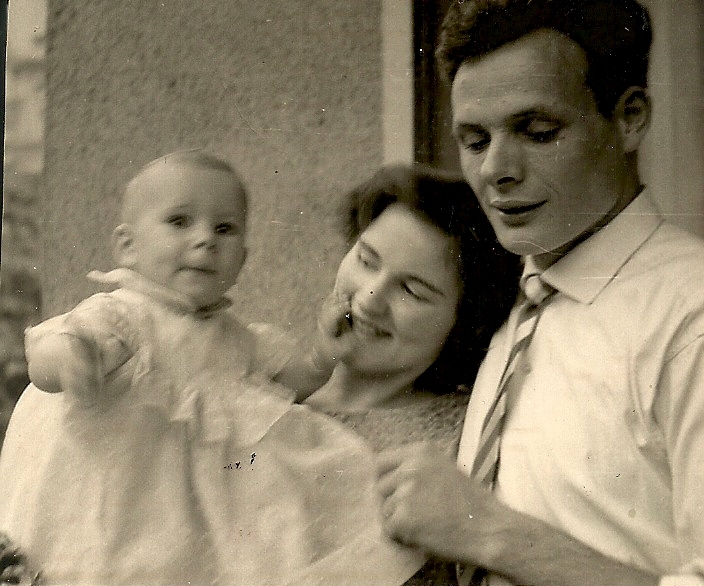 My youngest sister Gerry had polio when she was two years old. Fortunately she had no lingering effects, and recovered completely. I was ten at the time. I remember how scared we all were. Hi, Pam. We always love to look at all our old photos. Gaby was severely effected, She became a quadriplegic and needed an iron lung. Monika had some lingering effects in one of her legs and Martin recovered completely. It was a very scary time for us when all three children suffered from the disease. I really enjoyed seeing family photos, Uta. From what you’re sharing, the children were very young when they contracted polio. I cannot imagine how difficult that must have been! I do remember when that disease frightened families and changed lives forever! That’s right, Debra, they all contracted polio. Martin was 1, Monika 2 and Gaby was struck down with the disease on her fourth birthday. No vaccinations were available at the time. A bit later oral vaccinations were introduced. I think this stopped the spread of polio in Australia. It was a very emotional time for Peter too. All three children were admitted to Wollongong Hospital. Gaby went on to Intensive Care at Prince Henry Hospital in Sydney where she was in a coma. According to the specialist there was not much chance of her surviving. We had gone in the ambulance with her and stayed with her through the night. Early in the morning we went back to Wollongong on the milk-train. That morning after a lot of weeping we went to see Monika and Martin in Wollongong Hospital. Martin Baby soon became the darling of the nurses. He looked so cute. When we saw him he started throwing all the toys out of his cot the nurses had put in there for him. Monika was more sick than Martin and absolutely quiet. A few days later Martin was allowed to go back home. We were overwhelmed when we had him back home. Monika had to stay in hospital a bit longer. Once she was home she was referred to a specialist who treated her leg. Some muscles were weakened because of polio. She had to wear special boots and a splint on her left leg which she hated! I see that I responded to the original post. I was then ‘Three Well Beings.” I love the photos of your sweet family, Uta. Your vintage photos are so special and lovely! I know they bring you smiles. And memories of wonderful and not-so-wonderful. I have an older friend who had polio as a child. From then on, he always had struggles with his legs and walked with difficulty.